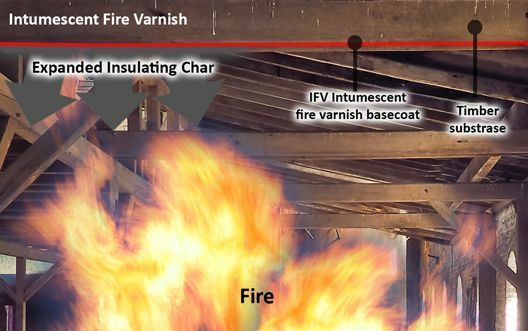 IFV Intumescent fire varnish basecoat is part of a varnish system with the option of a clear, tinted or stained finish for Fire Protection of timber and timber derivative substrates. The special formula provides a tough, durable finish to internal and external wood. Clear or stained finishes enhance the natural beauty of the wood while fire protecting new and previously varnished surfaces. IFV Intumescent fire varnish basecoat matt or satin provides protection against UV and wear. For class 1, 0, & B s2 d0 – 1 coat basecoat + 1 coat Interior /2 coats exterior Overcoat. For 30/60 minutes – 3 coats basecoat + 1 coat Interior /2 coats exterior Overcoat. FVO fire varnish overcoat Intumescent (internal and external) is a part of a varnish system with the option of a clear, tinted or stained finish for Fire Protection of timber and timber derivative substrates. The special formula provides a tough, durable finish to internal and external wood. Clear or stained finishes enhance the natural beauty of the wood while fire protecting new and previously varnished surfaces. FVO fire varnish overcoat Intumescent (internal and external) matt or satin provides protection against UV and wear. Clear 1 coat over basecoat. Woodstain 1 or 2 coats over basecoat. Weather & UV resistant overcoat. Clear or woodstain 2 coats over basecoat. 20 and 80 square metre packs. We supply a FREE of charge Certificate of Supply with each paint order or project. For this reason we ask customers to specify their needs on the relevant enquiry form to ensure we have all the necessary information to hand when we quote. Please contact us via the enquiry form, which steps you through the job specification, and we will provide a paint recommendation and quotation for the materials required. Technical advice and support is important in the selection and application of intumescent paints.